I've had the building itch lately. 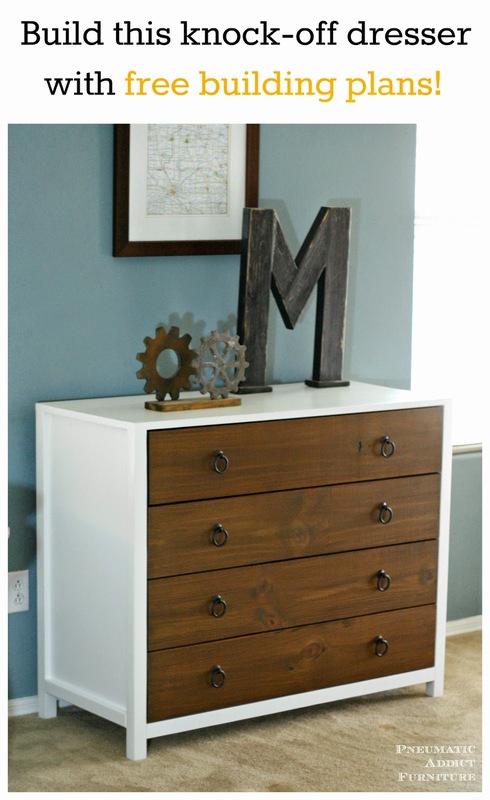 When I came across the Jordan Dresser from Pottery Barn Kids, I knew I had to build one for myself. I was shocked to read on the website that the PBK version is actually built mostly from MDF. My version is solid wood and only cost around $150 to build. 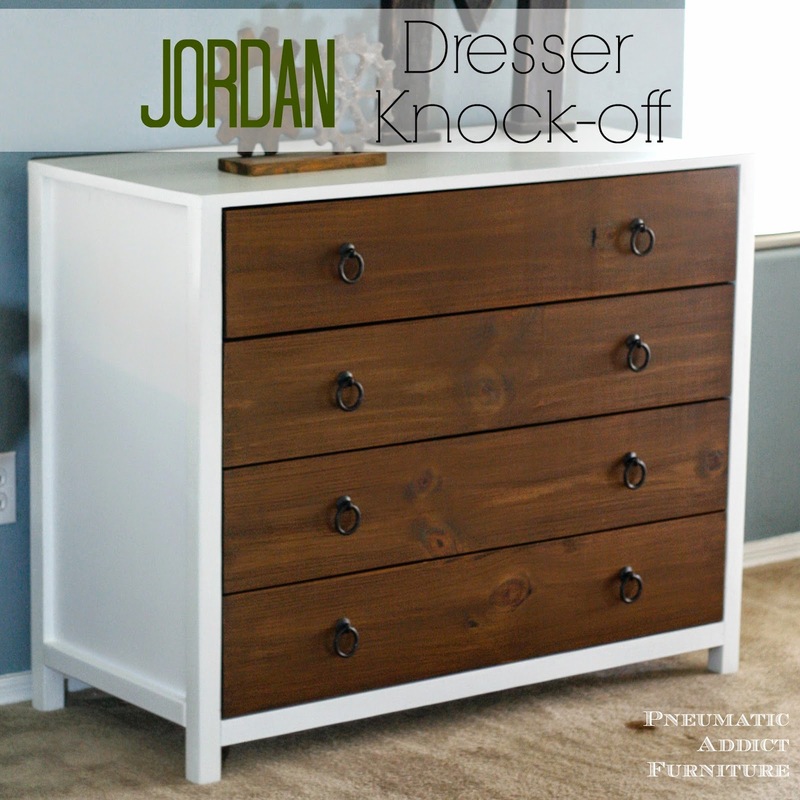 I've teamed up with my friend, the amazing Ana White, who generously sketched up building plans so you can build you very own Jordan dresser knock-off! Stop by her blog for a full list of supplies and a cut list. Here's the link. I started by attaching a leg on each side of both panels, using pocket holes and 1 1/4" pocket hole screws. You want the back flush with legs, so slide a scrap piece of 3/4" plywood under the panel to raise it up wile driving the screws. 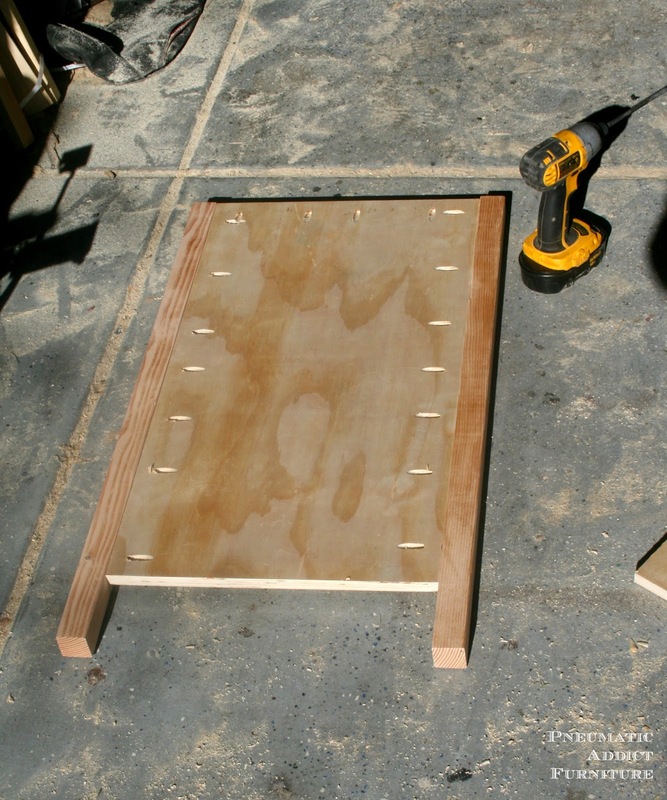 Remember to drill your pocket holes on the top end of the panel to make attaching the top of the dresser easier. 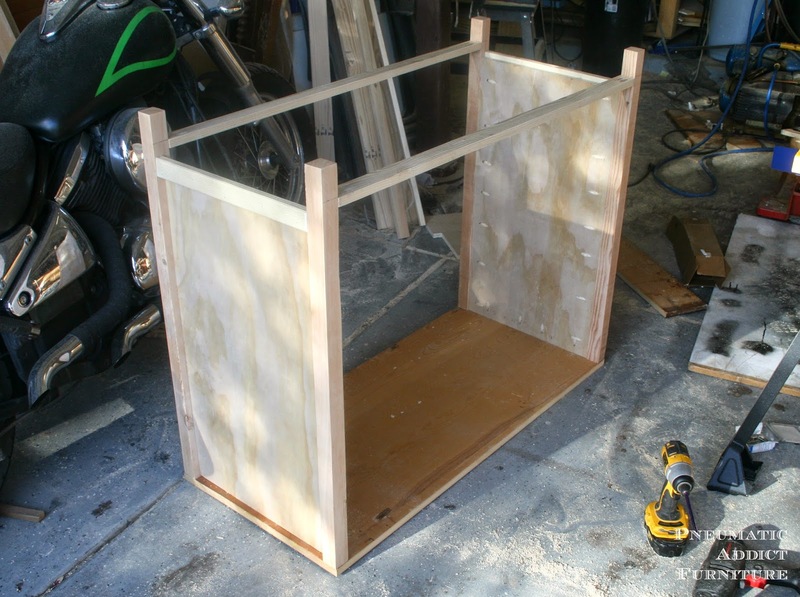 Next, flip the panel over and attach 1 x 2 decorative piece to the bottom, using glue and finish nails. 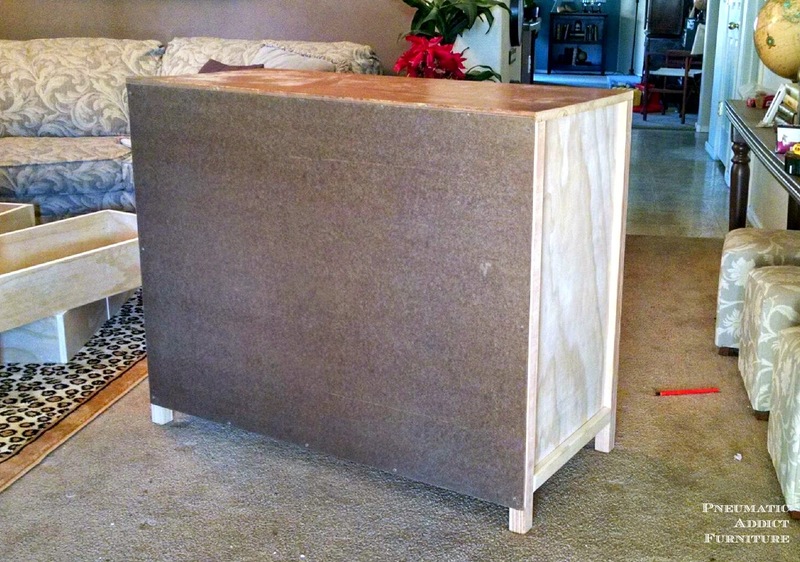 If you like to build furniture, keep your eyes on Craigslist for cheap old tables. 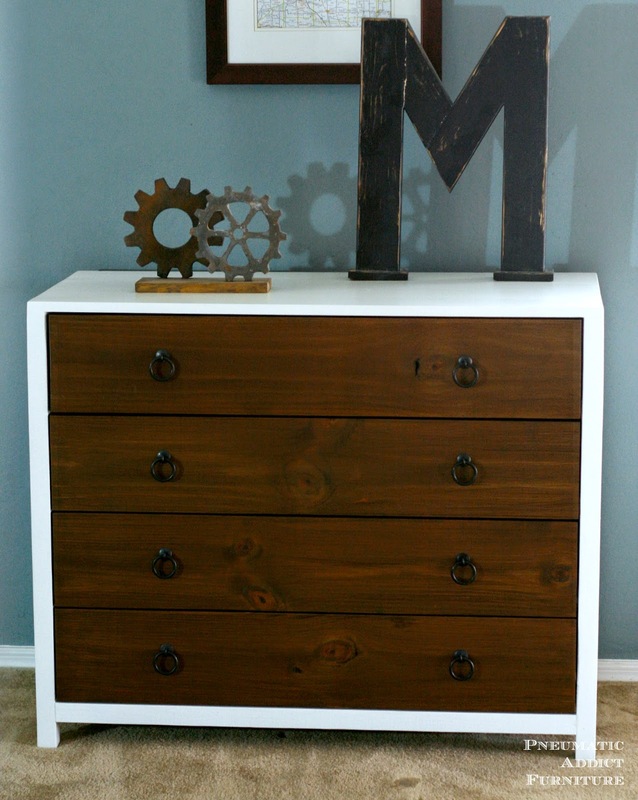 I have a small stash in my garage, so for this dresser I was able to cut one down and have a solid wood top. If you don't have spare table tops laying around, Ana's plans show how to piece one together using off the shelf lumber. Measure 2 1/4" from the end of each leg and with more pocket holes, connect the two panels together with the 2 x 2's. They should be level with the bottom of the plywood on your side panels. Carefully flip the piece over, align the frame on the pre-cut top. Using the pocket holes you already drilled, connect the frame to the top. Hardboard backer is that thin, particle board kind of stuff you see on the back of most furniture. It's really cheap (like $8) and found in the plywood section of Home Depot or Lowe's. Cut your sheet into a x piece. 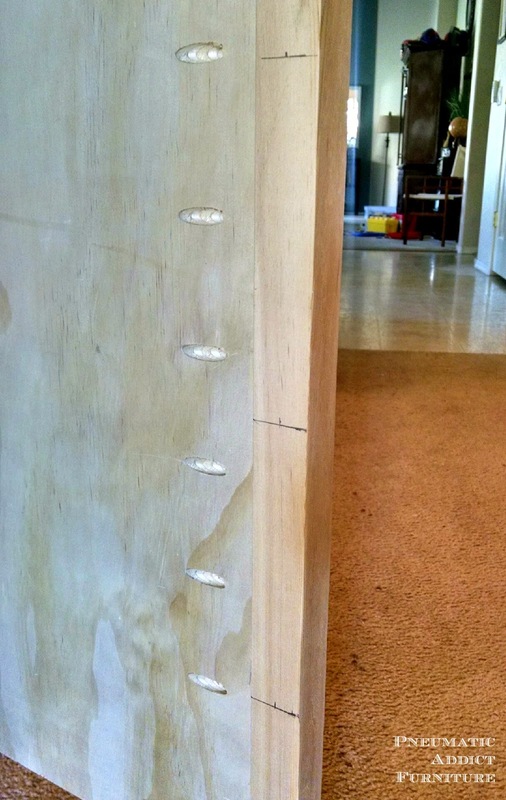 Attach the backer with either heavy-duty staples or small wood screws, all the way around the perimeter. Believe it or not, even a thin piece of hardboard creates a lot of structural strength for a piece. Using a speed square and measuring tape, mark four, 7 7/16" sections on the inside of the front legs. Mount your drawer slides 1/2" above each line. Did you notice I said to install the drawer slides before you build the drawers? I know it sounds backwards, but trust me, you'll be glad you did. I didn't follow my own advice with this dresser and spent 3 hours shimming and adjusting my slides to get them right. 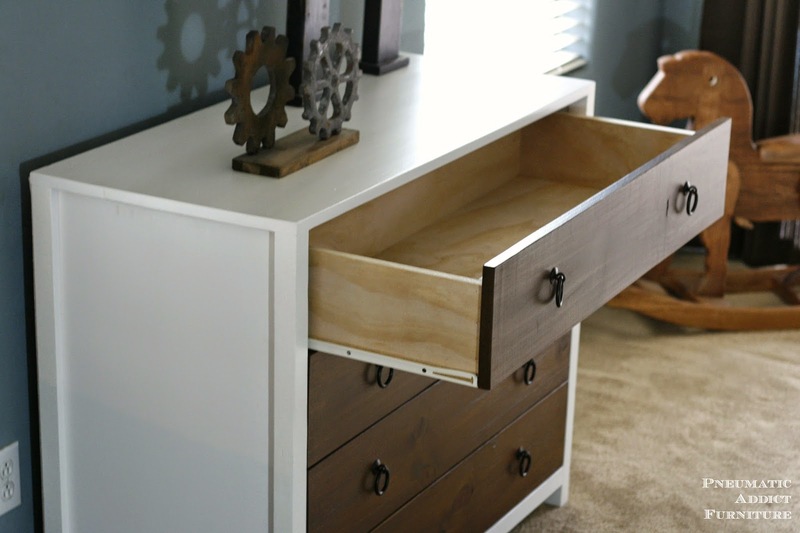 Drawer slides can be a bit tricky, but here is a fabulous tutorial to help you out a bit. The drawers on this dresser are "inset", meaning they are supposed to sit flush with the front frame once the faces are attached. 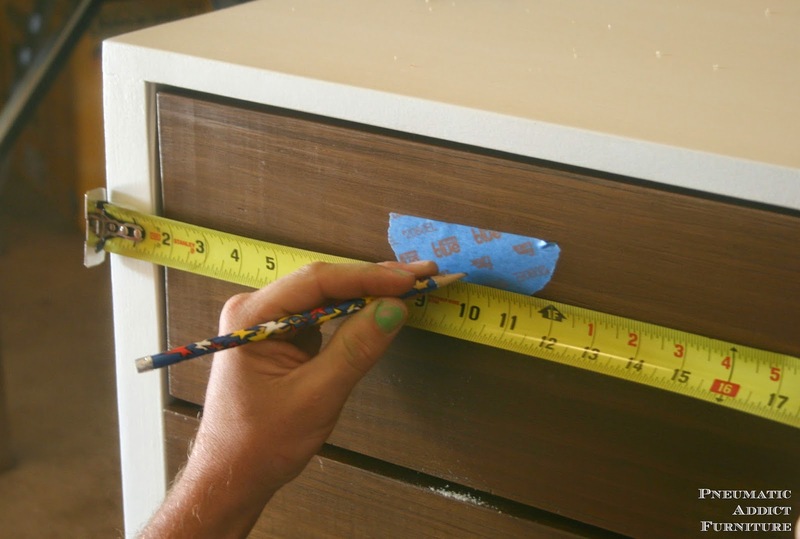 When the drawers are properly installed, the drawer boxes should be sunken 3/4" back from the frame. Time for drawer faces. 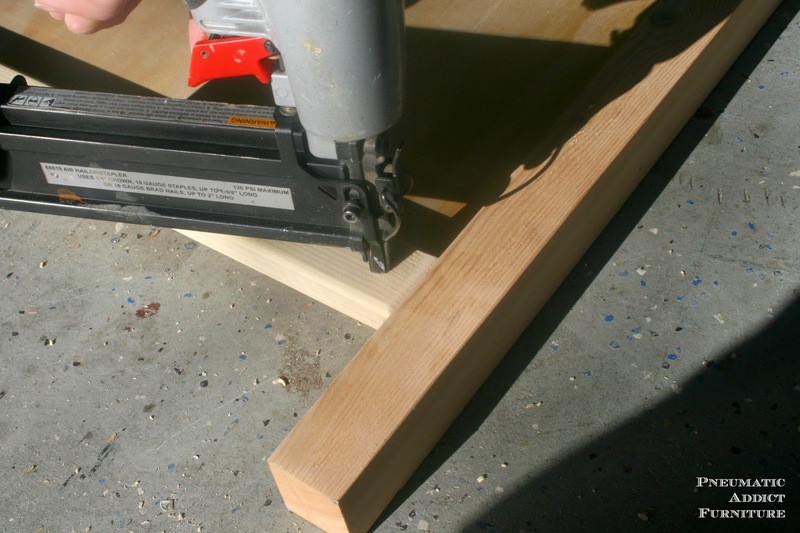 Measure the width of the opening, and cut your 1 x 8's, 1/4" shorter. This will allows a 1/8" gap on either side for the drawers to move freely. 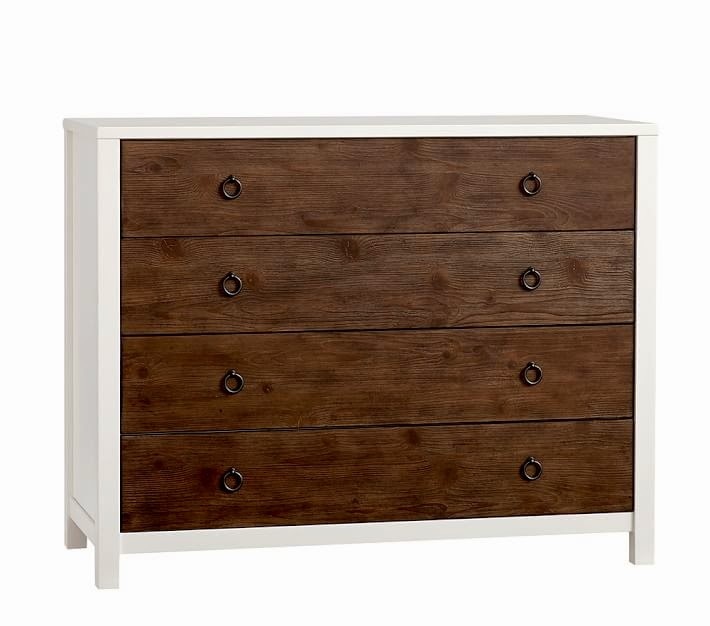 The drawer fronts on the inspiration have a raised, open grained texture. I have a tutorial coming up on how I got the same look. To give them color, I used my homemade oxidizing solution, and a couple coats of wood toner. 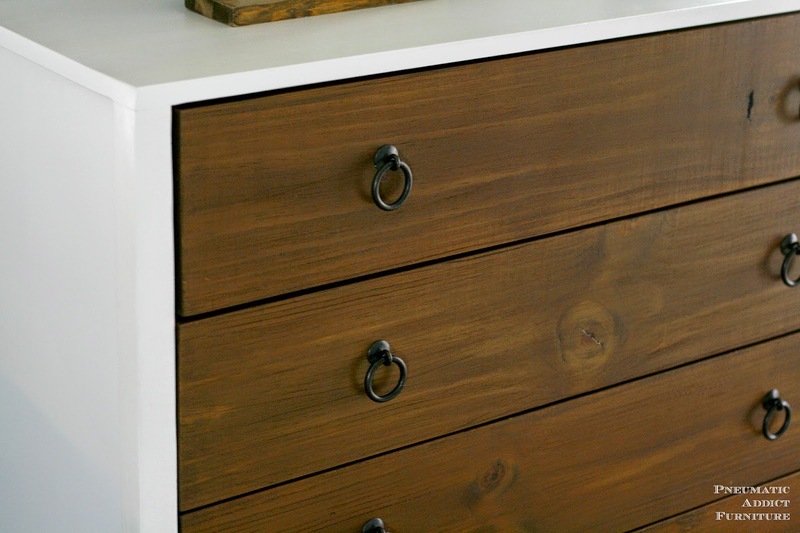 I wanted to keep the bare wood look, so each drawer front was sealed with 3 coats of matte polyurethane. 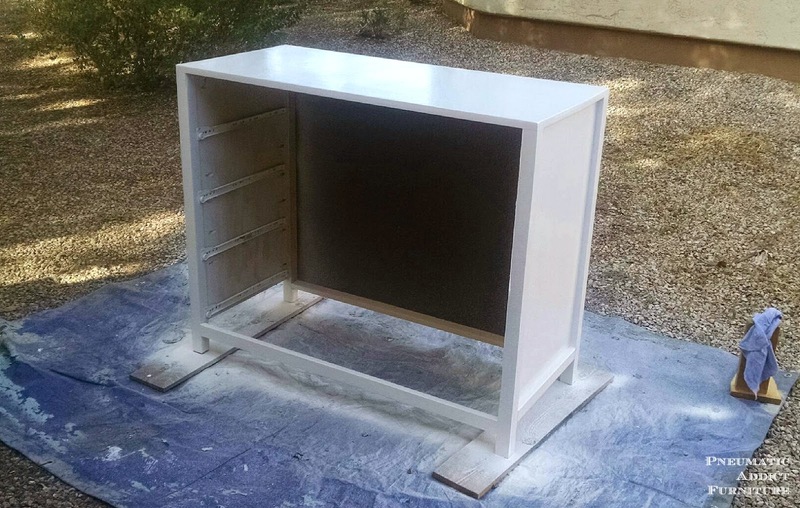 The body was sprayed with 2 coats of Simplicity from Country Chic Paint, and sealed with 3 coats of polyacrylic in satin. Simplicity is just as the name describes. The perfect, not too cool, not too warm, white. I reached out to you guys on Instagram to ask for your tips on mounting drawer fronts. Thanks for the great input! I've struggled getting them perfectly aligned in the past, but this time I tried a new trick. 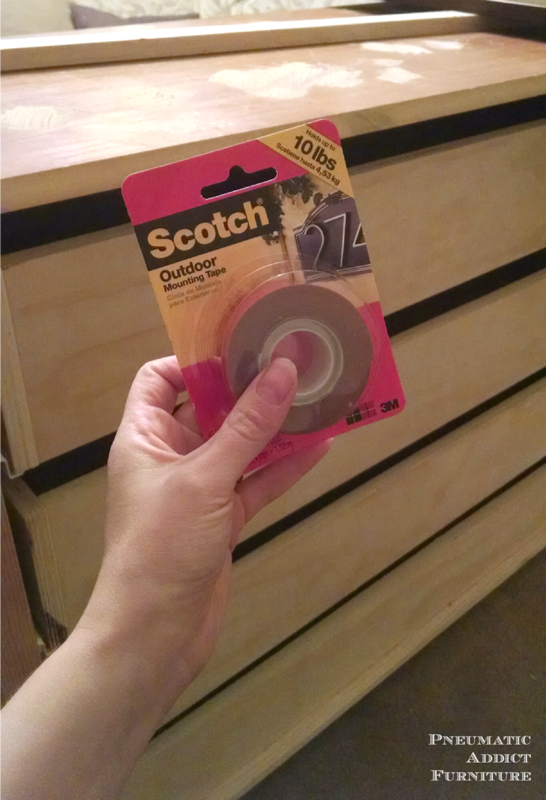 I found this *Scotch Exterior Mounting Tape for around $5. I placed a few pieces on each drawer and carefully lined up the faces, and pushed them on, starting with the top and moving down. 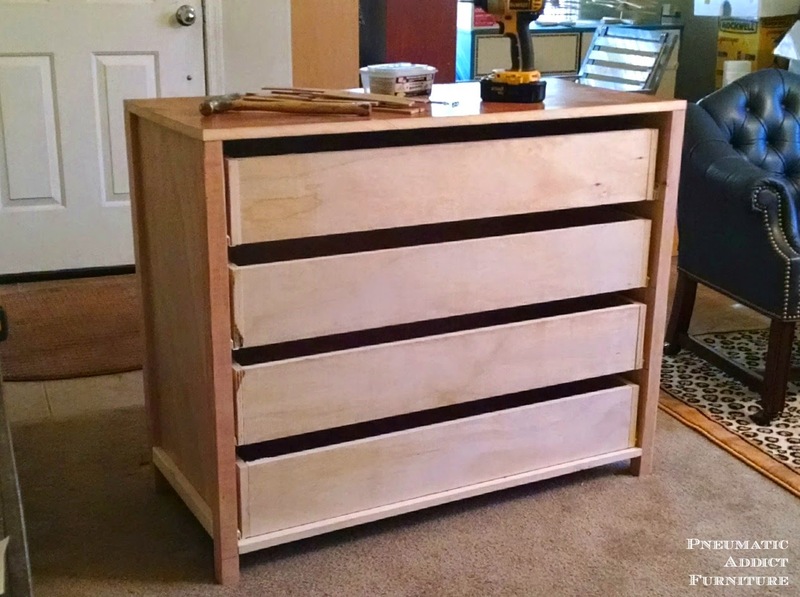 I carefully slid the drawers out, pre-drilled and drove two, 1 1/4" wood screws from the inside of the drawer box. The last step was to add some beautiful, iron ring pulls. 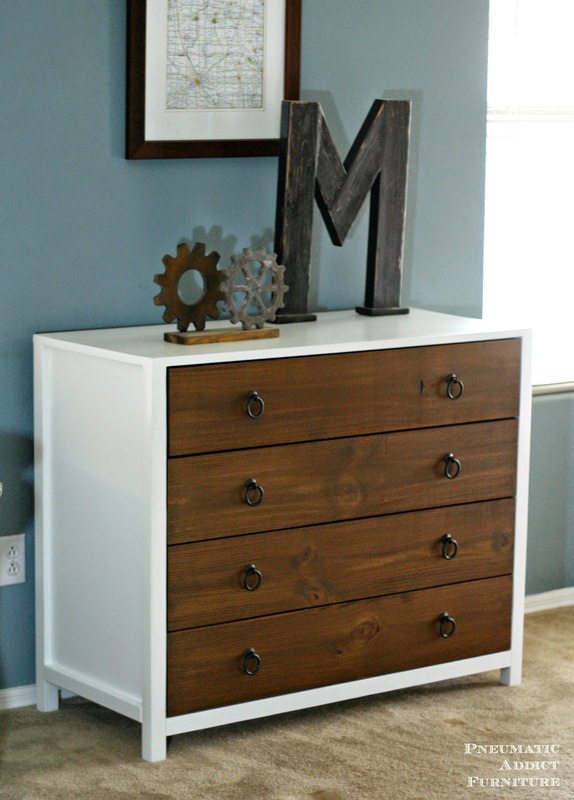 When you have a piece of furniture where the pulls line up vertically, I've found it works much better to measure from the outside of the frame, and not the drawer face. This way all the pulls will be in a perfectly vertical line. Another tip is to place a piece of *masking tape over the area you are going to drill. On a dark stained piece, the tape allows you to see your pencil marking much easier, and when you drill, the tape prevents the wood from getting marred or splintered. You caught me, my arms aren't really that hairy. I asked the hubs to step in so I could snap a photo. And here is final look. What do you think? Does it look like the inspiration? The pulls have to be my favorite part. Huge thanks to D. Lawless Hardware! You can find out how I gave off the shelf lumber a textured, raised grain look in this tutorial. Make sure to head over to Ana's site to get the free building plans. *This post contains affiliate links, and sponsored content. This is beautiful! Really looks as good or better than the original and is much more solid. Nice job! I am in awww. Usually with knock-offs you can always guess which one is the real deal, but yours is a true match. Great job. Beautiful! It looks just like the original, but better of course cause yours is real wood! Amazing job Elisha! And I love the tip about re using old tables! Wow, that's amazing! I don't think that I would be able to tell the difference it you weren't labeling them. Beautiful work! If I wasn't maxed out on furniture in my home, I'd make one too. ~M. Love the dresser, Amazing job!! Thank u for the detailed instructions. Seriously amazing! Sharing this tomorrow at YDTT! Thanks for sharing with us! This is absolutely stunning! 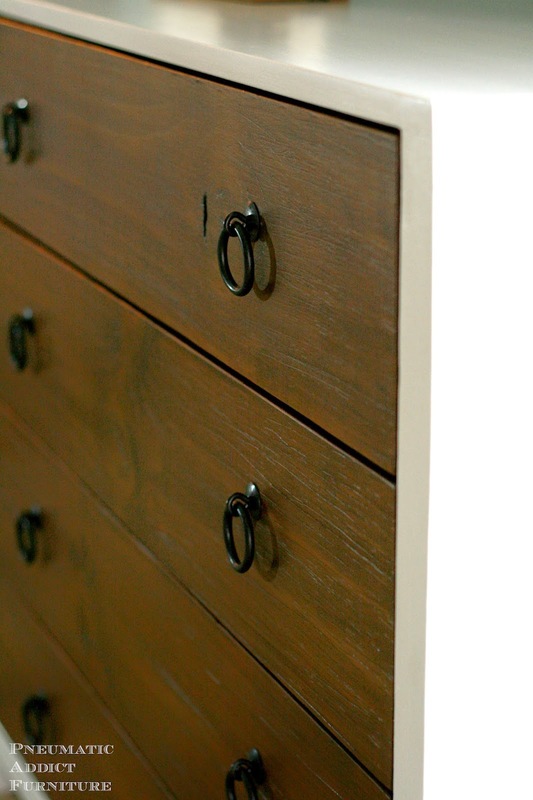 Loving the color contrast and the iron pulls are the perfect finishing touch. Oh my, you are talented!! It looks amazing!! Thanks for sharing with us at Work it Wednesday- featuring you this week!! This may be the closest knock-off I've ever seen - I don't think there is any way I could tell them apart in a line up! Thanks for linking up at The Creative Circle! I hope you'll join us again this week! This is beautiful and perfect for what I want to do in my bathroom but the link for the plans isn't working. Can you email them to me?